This summer, as an impulse purchase at a local nursery I bought a Moonflower vine (Ipomoea alba). I was looking for a vine to grow up our front porch to give it a classic southern feel. What a great plant it's turned out to be! 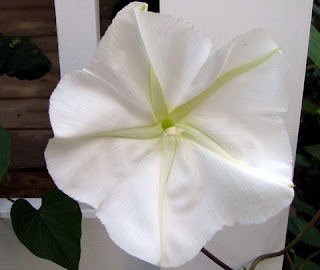 Moonflower (or Moon Vine) is so called because the flowers open up in the evening and are gone by the morning. They reportedly have a great fragrance that will fill the night air, though my vine has yet to produce a lot of flowers at the same time. The plant is incredibly fast growing, the vine has several branches each which seem to grow about a foot a day. I do not give it any special care, just a little slow release fertilizer and a good soaking every few days if we have not had any rain. Since the base of the vine is up against the base of the porch the roots are kept cool and mulch keeps them from drying out quickly. An important trait in this growth is that the vine holds to an object by entwining around it, there are no suction cups or hold fasts that can cause damage to a rail or siding. The leaves are large and heart shaped, much like those of the morning glory. In zone 7 the Moon Vine is an annual, however the vines produce copious amounts of seeds which can be sown late the following spring with an excellent germination rate. Give the Moonflower a try! Where did you find it? I have been trying (without *any* luck) to grow these from seeds. After three years of failing, I'm ready for some help and head-starts.